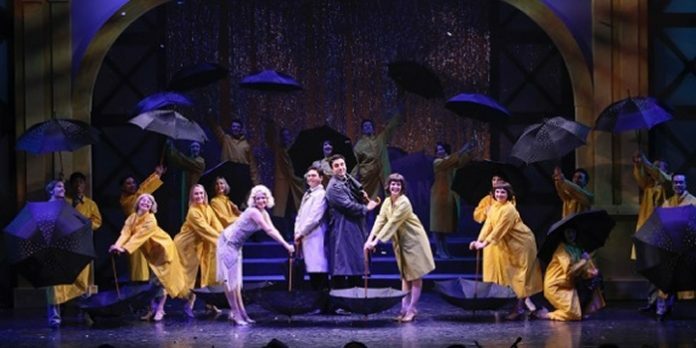 The cast of the Royal City Musical Theatre production of Singin' in the Rain. Photo by Tim Matheson. 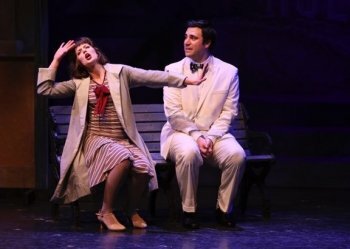 The big question on everyone’s mind at the opening of Royal City Musical Theatre’s (RCMT) production of Singin’ in the Rain was how they were going to deal with the title number? For anyone who knows the 1952 movie starring Gene Kelly, Donald O’Connor and Debbie Reynolds, on which this stage version is based, that scene has become one of the most iconic moments in film history (if you’re not familiar, you should really do yourself a favour and Google it). And even though the idea of sending thousands of liters of water down on the Massey Theatre stage may have only been a pipe dream, the anticipation on just how this largely non-professional company would handle this huge technical challenge did build some anticipation through the show’s first half. And while the solution doesn’t literally make a splash, the low-tech solution still provided sufficient theatrical magic. Overcoming its inherent technical challenges though is only part of this show’s equation. To be truly successful it needs chemistry, effervescent staging, choreography, plus both acting and vocal skills. These are essentials not only to carry those familiar with the movie, but to have enough pizzazz for the newbie to overcome its rather slight book. Fortunately, the RCMT production succeeds in most of this criteria. Before delving into this production further tough, for those who are unfamiliar with this classic movie, upon which this stage adaptation is built, it is the story of silent film heartthrobs Don Lockwood and Lina Lamont. Romantically linked in the eyes of the tabloids and public, Lamont’s feelings for Lockwood are not reciprocated. Tessa Trach as Kathy Selden and Andrew Cohen as Don Lockwood in Singin’ in the Rain. Photo by Tim Matheson. The problem is Lamont’s shriek of a voice doesn’t translate well to this new movie format. Saving the day is the ingénue Kathy Selden who dubs her voice over Lamont’s for the film. Not only helping to save the film, Selden and Lockwood have fallen head-over-heels for each other, much to the irritation of Lamont. True to form for RCMT, the choreography and vocals are all top-notch. 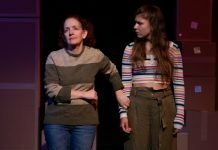 A hallmark of director and choreographer Valerie Easton, she once again demonstrates she is not afraid to push her primarily community and pre-professional cast to their limits. And when this ensemble comes together in some of this show’s biggest numbers, highlighted by the wildly over-the-top “Broadway Melody” and the group reprise of the title number at its finale, it is absolutely glorious to watch. Musical director James Bryson, who celebrates his own 30th anniversary alongside the company this year, gets the most of his leads, this large ensemble, and his orchestra. Both Andrew Cohen and Tessa Trach, who play Lockwood and Selden respectively, are top-notch singers. They are ably supported in the vocal department by Blake Sartin as Lockwood’s pal Cosmo Brown. It is Robyn Wallis as Lina Lamont however who gives the star turn in this show though, playing the ditzy blonde to hilarious effect. Special mention also has to go to Dane Smit in “Beautiful Girl”, who collectively took the audience’s breath away with his vocal abilities. Providing a clear, precise and feeling rendition as the featured singer in this production number, with a little coaching in dance and acting he will definitely be one to watch. But while the music is not a problem for this young company, unfortunately the same cannot be said about some of the acting, including the lack of real chemistry between Cohen and Trach. And when you consider Singin’ in the Rain is as much a love story as it is a folly about the 1920’s transition from silent films to “talkies”, it is problematic. Robyn Wallis gives a bravura performance as the ditzy Lina Lamont in Singin’ in the Rain. Photo by Tim Matheson. Ironically, this lack of chemistry is highlighted in Cohen’s rendition of the title song which never quite makes us believe he truly is “ready for love”. Director Easton doesn’t help matters though in some of the more intimate scenes between the two. This is especially true as the two take their first walk together onto the passarelle, which largely feels like an excuse to use this part of the stage. Other parts of Easton’s staging also feels a bit clumsy, especially in the early-goings. No doubt hampered by the seemingly endless scene transitions, there is also a sense some of the more intricate maneuverings are under-rehearsed. The addition of background players, another of Easton’s brand, becomes unnecessarily distracting. Perhaps in an attempt to distance themselves from their more famous movie counterparts, Peter Stainton goes too big as film director Peter Dexter, and while one can forgive Sartin for having to mime his way through his piano playing, he decides to go a little too snarky. Once again Christopher David Gauthier has the enviable task of dressing such a large group in sometimes spectacular fashion, and Brian Ball’s set design provides the much-needed space for the show’s big numbers and numerous transitions. The filmed sequences are top-notch over-the-top fun, adding an air of authenticity to this musical about Hollywood. The choice of Singin’ in the Rain as the 30th anniversary milestone for RCMT is interesting. A new show for the long-running company’s repertoire, one would have thought the more obvious decision would be to bring back an all-time favourite. But then, after three decades RCMT surely knows its audience, and while it doesn’t always deliver the goods there is still enough nostalgia and good-nature fun. Singin’ in the Rain, based on the Metro-Goldwyn-Mayer film, by special arrangement with Warner Bros. Theatre Ventures. Screenplay by Betty Comden and Adolph Greeen and songs by Nacio Brown and Arthur Freed. A Royal City Musical Theatre production. On stage at Massey Theatre (735 8th Ave, New Westminster) until April 20. Visit royalcitymusicaltheatre.com for tickets and information.